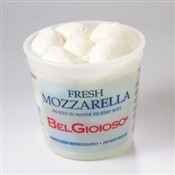 Fresh Mozzarella CheeseBelGioioso Fresh Mozzarella is soft cheese that is delicate and smooth and can be utilized in a large variety of recipes or served plain in a caprese salad. 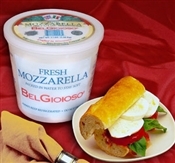 2007 United States Championship Cheese Contest Winner in Fresh Mozzarella! 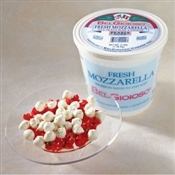 This soft cheese, made from cow's milk, is packed for freshness. 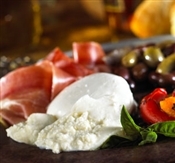 Its delicate flavor and porcelain white appearance enhance salads, sandwiches and other light meals. 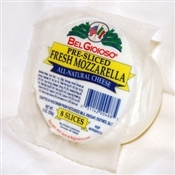 BelGioioso Mozzarella has won numerous awards including 2002 American Cheese Society Nineteenth Annual Judging as "1st Place"" Best of Class, 1994 American Cheese Society Eleventh Annual Judging (1st Place) Best of Class and 2003 American Cheese Society (2nd Place)." 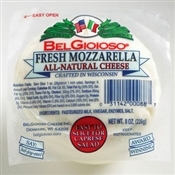 Fresh Mozzarella must not be in transit for more than 1-2 Days. Please choose your shipping method accordingly. 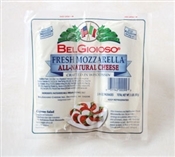 Ground shipping is only available for Wisconsin, Illinois, Minnesota & western Michigan residents.